Islam is at once a religion and a total way of life. It prescribes order for individuals, societies and governments and codifies law, family relationships, matters of business, etiquette, dress, food, hygiene and much more. The ummah, or community of believers, is unified across national boundaries by its conscious acceptance of the oneness of God and its dedication to the teachings of Islam. There is no human hierarchy that intervenes between the individual and God; in the eyes of Islam, all people are equal. The Qur’an, the holy book of Islam, is the Word of God as revealed to the Prophet Muhammad in the Arabic language. It is the final revelation and Muhammad is the final Prophet. 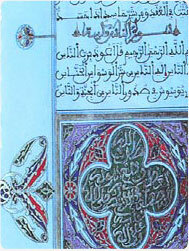 For 14 centuries the Holy Qur’an has illuminated the lives of Muslims with its eloquent message, shaping their everyday lives, anchoring them to a unique system of law and inspiring them by its guiding principles. The Sunnah (teachings and sayings of the Prophet Muhammad) complements the Holy Qu’ran as it embodies his meticulously documented teachings that were preserved by his companions in a body of writings called the Hadith. The Holy Qur’an and the Sunnah provide the framework for Shari’ah, the sacred law of Islam, which governs all aspects of the public and private, social and economic, religious and political life of every Muslim.